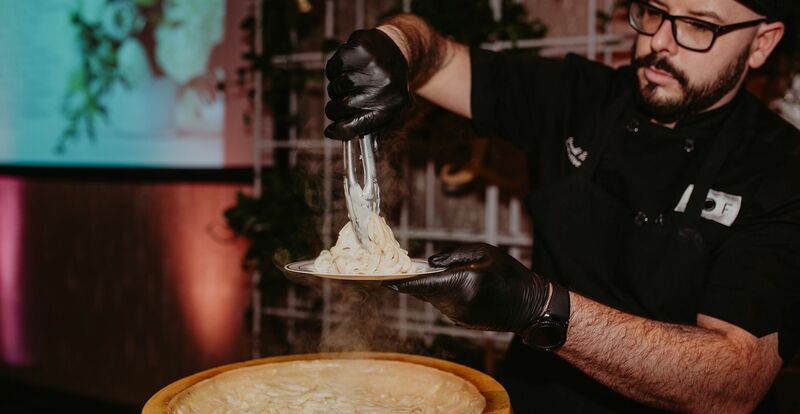 At Attitude on Food our philosophy is simple: we will give you the most innovative, highest-quality food wherever you need it – in the workplace, in your home, or on your wedding day. We source the best local produce and pride ourselves on using only the finest ingredients. Our menu items draw from the finest ingredients and every dish is created with precision, confidence, and attention-to-detail. Our menus are flexible and original. Our team prides itself on working closely with you to gain an understanding of your specific event needs so that we can design the best menu suited for you – all in a quick and responsive manner. It has been a pleasure working with you over the past year. From the initial telephone conversation regarding our events, you listened to all of our ideas, expectations, and needs, and worked through all of them. From the Award Ceremony held in June, our Holiday Party, and Employee Recognition Luncheon in December, you surpassed our every expectation. The food at each of the events was divine and provided the variety we wanted. Your opinions while we worked on our event layouts were instrumental to their successes. During the events, your staff, as well as yourself, were all very approachable, professional, and open to suggestions. Not to mention your staff’s initiative and willingness to help is to be commended. I am looking forward to working with you in the near future! Probably one of the most compelling reasons I work with Nathan so frequently is the creativity in his menu offerings and his ability to create menus for special occasions. The number two reason I use AOF consistently is the professionalism and reliability of his staff. Nathan has top notch staff that is ably equipped to carry out our often unusual requests, and is always able to think on their feet with last-minute things that occur in events. I enjoy working with Nathan and his staff and that we have built a relationship of trust and I know I can always count on them to come through to the best of their ability at every event. We at the University of Nebraska Foundation have called upon AOF for the majority of our catering needs throughout the past two and a half years. In 2011 alone, AOF produced more than 35 events for the Foundation, 15 of which had attendances of more than 250 guests. Chef Nathan Newhouse and team not only continuously exceed our expectations with fantastic food, creative ideas, and unparalleled service, but also manage a fantastic team who has an obvious passion for their industry. Passion like theirs keeps clients like us coming back often. I, without a doubt or hesitation, would recommend Attitude on Food. PLEASE NOTE: All food pickups will be out of our kitchen located at 2405 N Street!